It all started when we were out at a family restaurant one afternoon, and my son and I approached the balloon twister. The lady asked him what kind of balloon he'd like. "A flower," he said. "Oh I'm surprised to hear that! Are you sure you don't want a dog?," she replied. Right there, I felt anger welling inside me, but I smiled as we walked away with the flower balloon. Of course, my preschooler hadn't caught the gender stereotyping, but my mind was filled with a thousand thoughts. I like the idea of gender neutral toys. Even gender neutral clothes are fine, if some parents like it that way. 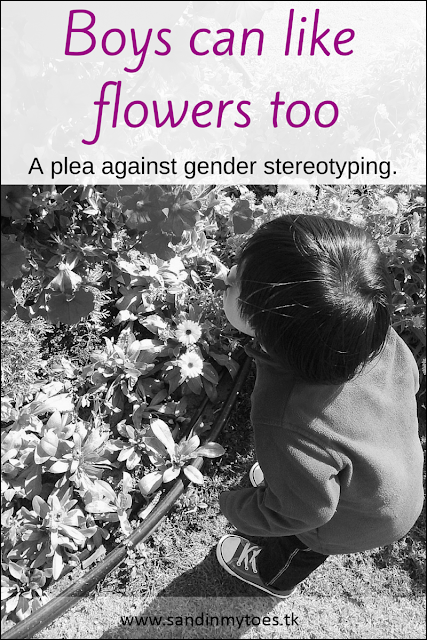 At the same time, I understand that boys and girls are inherently different. There are some behavioural traits that most boys exhibit, and is less common in girls. However, I also like to believe that every child is different. If most boys like fire trucks, it doesn't mean that some girls don't. That's why I had a problem with that lady's attitude. My son likes nature, and so he loves flowers. And why shouldn't he? They're beautiful! He has some pink toys too, and so far, has not been brainwashed by society at large into thinking that they are 'girly'. In fact, when we go to the toy store, he doesn't think there are boys and girls sections and chooses whatever he likes, regardless of colour or packaging. Before I became a mom, that's exactly how I wanted my child to be. I didn't want my child to ever be bound by gender stereotypes, and I definitely didn't want them to be told what they could or could not like. So, if my son wanted a flower balloon, he shouldn't have been questioned for it. I'll bet that lady would have reacted similarly if a girl had asked for a sword balloon. We know how things are marketed aggressively towards girls and boys. Perhaps, this is the way some industries try to increase their sales by ensuring that brothers and sisters have different sets of toys. While some companies like Target have taken big steps towards doing away with this, I feel the onus lies on us as parents to not perpetuate this gender-exclusive thinking. My request to grandparents, uncles, aunts, friends, and non-parents is this - do recognize a child's unique personality and their likes and dislikes before making an assumption based on their gender. If you don't know my son enough, hide your surprise if he says he likes flowers, and not spiders.